Metropolitan Family Services DuPage is pleased to honor Mr. and Mrs. Steven Gonzalez as the Roger K. Johnson Award Recipients at the 18th Annual DuPage Gala! 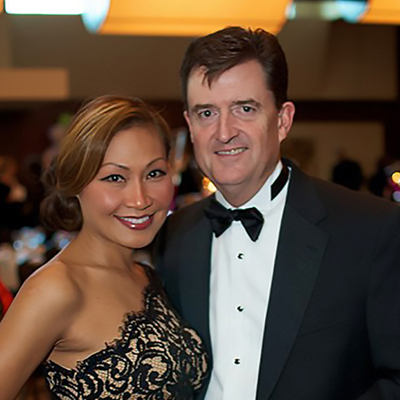 Join us in honoring Steve and Dina Gonzalez at the DuPage Gala! Last year’s honoree, Kim Stapleton, will present the Roger K. Johnson Leadership Award. Register for the May 10 event here. Steve and Dina Gonzalez are dedicated supporters of Metropolitan Family Services DuPage. They are leadership supporters for the Campaign to Mpower Families in DuPage and are strong ambassadors for the community impact of Metropolitan Family Services DuPage programs. In addition, Steve was an active DuPage Board Member and a transformational Development Committee member. He also extends his leadership to Metropolitan’s agency-wide Investment Committee. Steve continues his involvement in the DuPage Alumni Board. Through his leadership, Metropolitan Family Services was showcased at Bernstein Private Wealth Management’s Annual Global Conference, Safer Chicago: The Ripple Effect, which focuses on how to best address the inner city gun violence issue in Chicago. Steve re-joined Bernstein in 2006 as a Financial Advisor in the Chicago office and was named a Principal and Senior Investment Advisor in 2010. He has successfully advised high-net-worth individuals, families and institutions for most of the last 20 years. He previously spent almost 20 years at AT&T in a variety of sales and marketing leadership roles, both in Illinois and New Jersey. Steve holds a BS in finance and marketing from Illinois State University, and he also completed the Executive Education Program at the Kellogg School of Management at Northwestern University in Evanston. After a 25-year career in business development in the areas of technology strategy and IT integration services for Fortune 1000 companies, Dina is currently enjoying a sabbatical from Verizon Enterprise Solutions. Steve and Dina were raised by loving families that always stressed giving back, which led them to Metropolitan Family Services back in 2009, shortly after their return to DuPage County. Since that time, they have served in a variety of volunteer capacities at Metropolitan, most of which focused on fund raising efforts in order to better serve those in need in DuPage County. They have been married for 15 years and are the proud parents of daughters Alex and Hayley, and son, Matt. When Steve isn’t contributing his resources to help others, he enjoys playing golf and baseball, including participating in the St. Louis Cardinals Fantasy baseball camp for the past 7 years, where he’s gotten to know Hall of Famers Ozzie Smith, Whitey Herzog and Bruce Sutter.